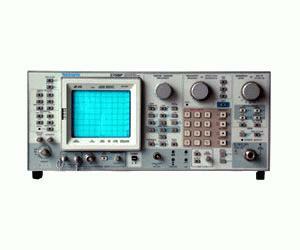 The Tektronix 2755AP Programmable Spectrum Analyzer offers a broad selection of features and benefits to meet wide-ranging needs for laboratory-level frequency domain spectrum analysis. The unit provides full IEEE-488 (GPIB) programmability, which means you can change front-panel settings, read data from the CRT display, and send waveforms from internal digital source memory to other GPIB devices. The 2755AP covers the same frequency range as the 2756P and provides nearly the same set of outsyanding features. It is designed as a cost-effective and productive solution to engineering needs.